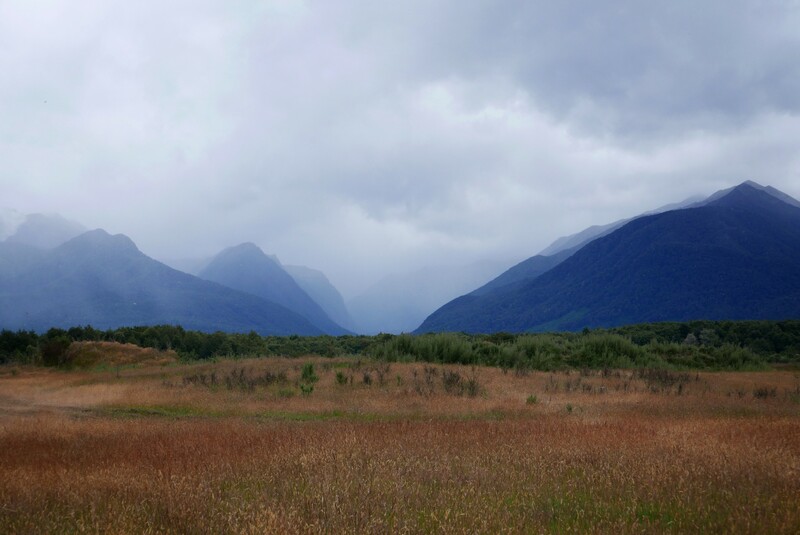 We had to get up quite early in the morning to be at the Real Journeys office in the near by town of Manapouri at 8 a.m. It was a cloudy morning, and it rained now and then. 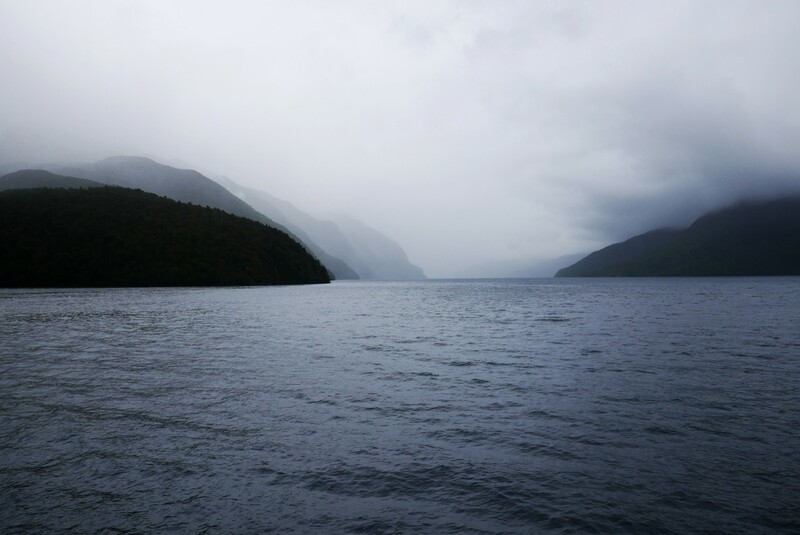 We were going on a boat trip on Doubtful Sound, something we had been looking very much forward to. It was a 15 minute drive there, but everyone was still a bit tired from the late arrival the previous day. 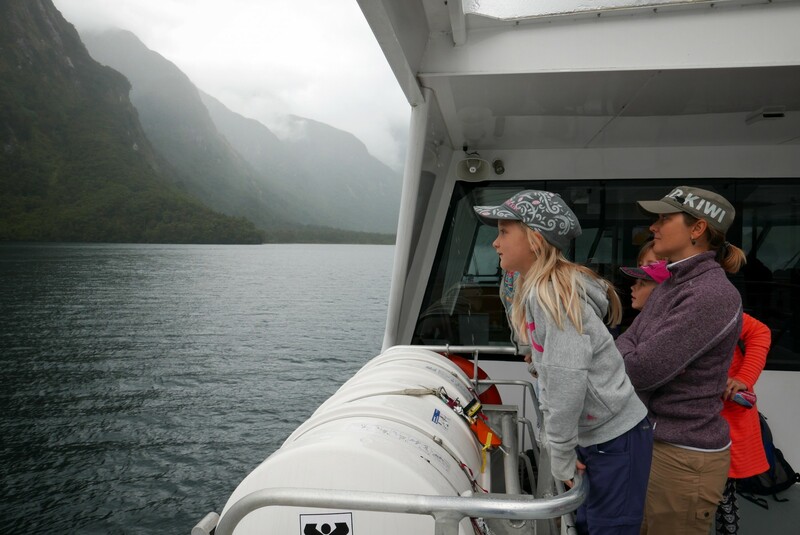 The tour started with a boat trip across Lake Manapouri, followed by a bus ride across the Fiordland National Park to Doubtful Sound, and finally a 3 hour boat trip on the Doubtful Sound. 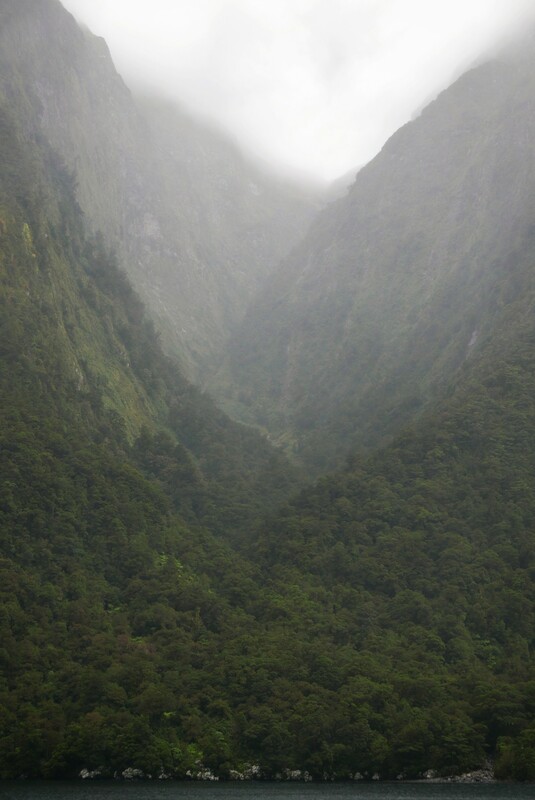 Doubtful Sound is definitely a beautiful, isolated place. At one time, the tour guide stopped the engines and asked everyone over the loudspeakers to keep still for a while. We were surrounded by luxuriant mountain walls dropping steeply into the fiord, everything was wrapped in mist and low hanging clouds, and the silence was suddenly very clear. We heard birds singing somewhere on the mountains, and raindrops falling on the water. Quite a unique experience. We met another Danish family with girls the same age as ours on the trip, and Ronja and Frida enjoyed hanging out with Danish children for a while. 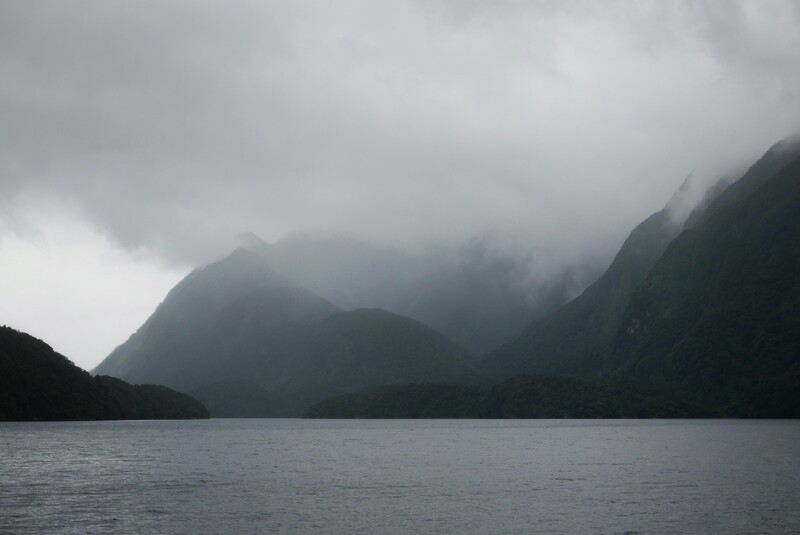 After sailing on Doubtful Sound we were taken back to Manapouri by bus and another boat. I have to say, in spite of the grandeur of the fiord, I was a little disappointed with this trip – even though we were well looked after by the staff and the boat was fine – going to a place where the quiet solitude is the main attraction works best in smaller groups. On this trip, they had to fill up three buses to get us across the Fiordland National Park, and the boat ride itself was a bit too much of a ferry experience for me. The beauty around us was evident, there were just too many people for us to really feel close to it all. We will have to go again some day in our own sailboat. Driving back to our camp site, the mountains once again showed off what they can do in cloudy weather. 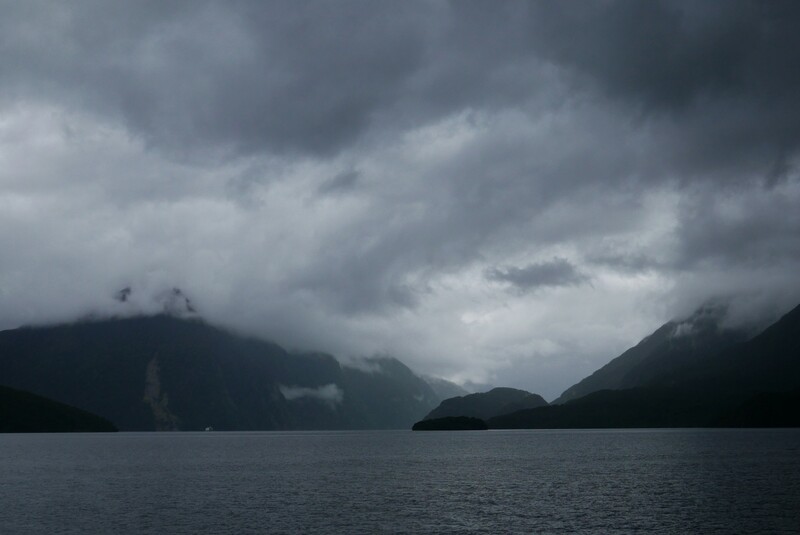 This entry was posted in New Zealand, Travel and tagged cloudy, Doubtful sound, fiordland, fiordland national park, new zealand, nz.